It happens every Fourth of July. I get all matchy-matchy. From my clothing and accessories, right down to my red white and blue nails. This Independence Day I'll be sporting my Fourth of July fashion looks as well as red,white, and blue accessories. Do you like to wear red, white, and blue, for the Fourth? These accessories are super adorable. All of them. Now I want to go shopping! So adorable! Those wedges are super cute. 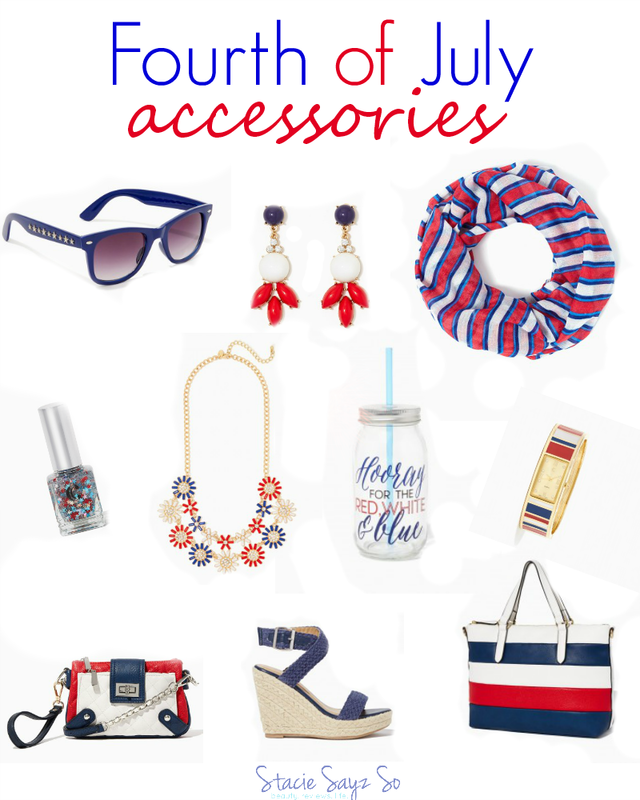 I don't really get into the red, white and blue for the holiday but these accessories rock! I love red, white and blue! It's a pretty color combo and you can wear it year round. These accessories are great! Red is my favorite color. I love to wear red, but blue is starting to become a favorite as well. I dress the kids in red, white and blue for July 4. I think it's fun and I like to give them a quick history lesson.